iPad tablet from Apple is making all the buzz with positive reviews. It promises great way to access web content and other content like ebooks, newspapers in a neat and large viewable format. You can also access Google services like Gmail, Youtube and more in tweaked manner best suited for large display of iPad tablet. As against usual Gmail interface, you will see different and more neater display taking full advantage of iPad’s large display. 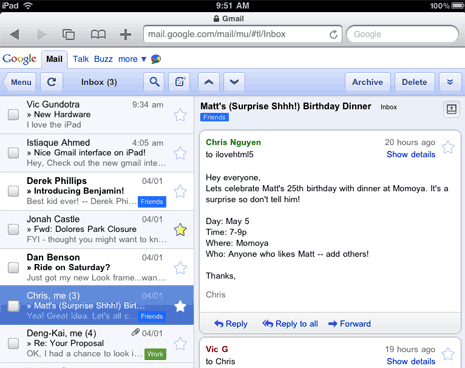 Gmail account contents are displayed in 2 pane view with list of conversations on the left side and messages on the right side. It is an experimental user interface for the iPad built on the Gmail for mobile HTML5 web app that was launched last year for the iPhone and Android devices. Just launch web browser & login into gmail.com to access email account.